Stress seems to be the bain of our lives, we fight it, we complain about it but do we really take the time to unwind and centre ourselves, in order to be in balance and less susceptible to stress? 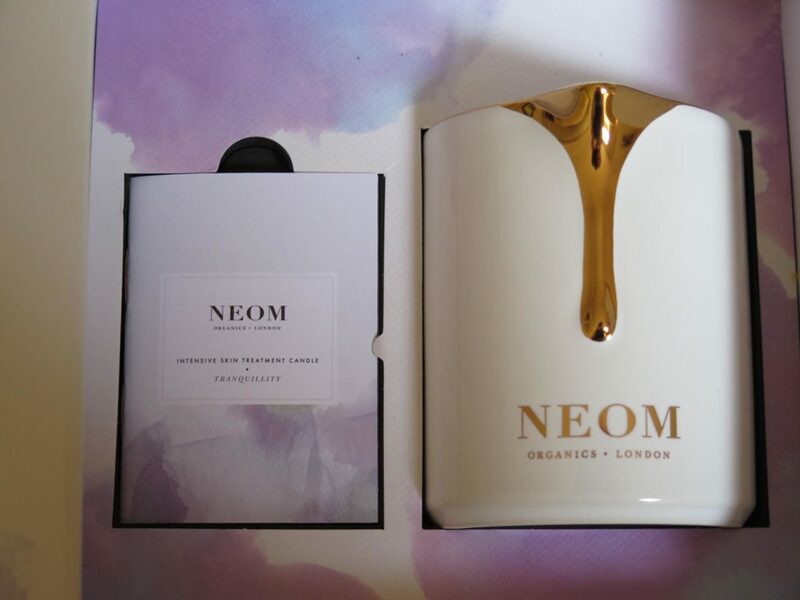 Women in particular have a problem with guilt when it comes to taking the time to nurture themselves and that’s why I think this latest launch from NEOM Organics should be given to every women – it is a fragrant multi-tasker, like we are (!) that will nurture us, with hopefully no guilt attached. Having seen the video of Nicola Elliott, NEOM Organics founder, talking about the Intensive Skin Treatment candle made me feel relaxed and curious but in order not to distract you from my review of it, I will put it in at the end (feel free to scroll down if my ramblings get too and you want some condensed clarity from Nicola). This product had me at ‘hello’. When I came home from a particularly frazzled and busy morning the box awaiting me on my house porch smelled so beautifully, I am sure my wrinkles on the forehead unwound themselves there and then. Opening the actual box and seeing the beautiful, art exhibit worthy packaging, ( dreamed up and designed by Nicola ), reminded me of melting pot of gold and made me smile – that’s quite impressive, considering at that stage I haven’t even lit it up. Nicola is a big advocate of kicking the stress and nurturing yourself, so this treatment candle was inspired by NEOM Wellbeing Spa Treatments, particularly drawing inspiration from the Sleep & De-stress ones. One of its main aims is to treat your tired skin, as well as the senses, while relaxing the mind and letting you get your body and mind connection in sync. You can choose from two of NEOM’s signature blends, Real Luxury ( lavender, jasmine and Brazilian rosewood ) & Tranquility ( English lavender, sweet basil & jasmine ) depending on what you feel you need more of. Nicola recommends the first one for a night in and the Tranquility before bed, to help you have a restorative and peaceful night’s sleep. But it’s not just about lighting the candle and enjoying its subtly beautiful aroma. The skin-nourishing formula will repair and protect the skin, particularly dry, tired and stressed. Light the candle, let it warm up and burn for at least 30 minutes and then you can use it for massaging yourself after a two minutes cooling period ( or your partner or girlfriend, if you are having a girl’s pampering night in ). Massages are good for us not because just because of the touch, but also because they increase our circulation and will allow the special blend of restorative NEOM oils to penetrate your skin and hit the bloodstream in twenty minutes. In terms of ingredients the candle wax combines cocoa seed butter, vitamin rich soybean, sweet almond oil, as well 16 other specially selected pure essential oils and a 100% natural vegetable wax. I have used massage candles in the past and even had a hair-raising experience in one of the spas when the oil got poured on my skin, almost burning it – my therapist at the time tried to entice me to come back on the treatment table but I literally rang like the wind. Would it be fair to say that I wasn’t a huge fan of massage treatment candles ( unless I trust the massage therapist !)? The answer would be yes, but I have to credit Nicola, this candle did change my mind, in part because it was formulated with a low melt point and the fact that it is recommended to drizzle the oil on your skin after the two-minute cooling period ( do read the instructions, they are short, to the point ( you might also learn something new and will integrate it into your lifestyle ), making for a slow, sensual and enjoyable experience in the privacy of your own bathroom or bedroom. When you light a candle, inhale deeply, let go of the worries of the day and make a wish or set an intention for the future. Then you can get on with your bedtime routine or do a meditation practise while inhaling 24 potent & stress relieving oils that are blended in Real Luxury candle or prepare your mind and body for a deep sleep with 19 sedative oils found in the signature scent of Tranquility. As you inhale, the oils travel to the limbic system and are met with 50 million receptors; the oils then go in the direction of your olfactory bulb (your sense of smell) and the work on relaxation of your mind and body fully begins ( see what I mean about the educational element of NEOM ?!). I started my journey of discovery with Tranquility ( being a jazzy Duracell bunny, that suited me perfectly ). First time round I lit up the candle while doing my evening skincare routine and massaged my arms and legs before going to sleep, happily content to luxuriate in the moment. On the following occasions I worked at my desk, as the candle burnt, but as it does have a tendency to relax me, I made sure that it didn’t require heightened focus. But most of all I love to meditate on the mat next to the candle and feel that the candle enhances the whole experience, making me feel focussed & grounded. The oil feels silky and rich when you drizzle some on the palms of your hands before massaging it all over your legs and arms, as well as elbows, knees and heels that might feel dry. I can suggest adding a mantra of ‘I love myself’ as you do it – and I don’t mean it in an egoistic or narcissistic way. What I mean is that if you love and nurture yourself the face and body that you will present to the world will be honest and happy. When you are happy positive energy spreads exponentially on to the people that surround you. Breath, meditate and burn those wonderful NEOM candles and may the luxury or tranquility be with you. For more information log onto www.neomorganics/wellbeing to learn about the perfect night’s sleep or how to relieve stress, calm or boost your energy and lift your mood.